Meet Kara Wai and Carlos Chan at the world premiere of “Happiness” on Friday, July 15. Tomorrow, happiness is just a Facebook comment away. To celebrate the kickoff of our twenty-first Made in Hong Kong Film Festival, we’re giving away reserved seats to Happiness tomorrow night—and a meet-and-greet with its two stars, Kara Wai and Carlos Chan. To win, be among the first five people to comment “I heart Happiness!” on our Facebook post about the giveaway, which we’ll share at noon on Thursday, July 14. Then, get ready to spend Friday night at the National Museum of American History with a legend of Hong Kong film. Entrants must be natural persons, current US residents, and 18 years of age or older, except that entrants may not be a regent, officer, employee, fellow, intern, research associate, or volunteer of the Smithsonian Institution or a member of any of the foregoing’s immediate family or household. To win, be among the first five people on Facebook to comment “I heart Happiness” on a post about the contest, to be shared at 12 pm on Thursday, July 14, 2016. The contest is associated with the first film in the Freer|Sackler’s Twenty-First Annual Made in Hong Kong Film Festival. One entry per person. Multiple entries are void. The Smithsonian will award the same prize to five people. The winner and one guest together will receive a meet-and-greet with actors Kara Wai and Carlos Chan on July 15, 2016, at 6:15 pm, as well as two reserved seats at the film Happiness at 7 pm that evening (all times Eastern). Both events are held at the Warner Brothers Theater in the National Museum of American History at 14th St and Constitution Ave NW, Washington, DC 20001. Winners are responsible for any costs, including their travel to the prize events, associated with acceptance and usage of the prize. Smithsonian will notify winners via Facebook. Failure to respond within 24 hours means the winner forfeits the prize. Winners may be required to execute an affidavit of eligibility, publicity and liability release. Winners may not request prize substitution. The Smithsonian will announce the winners by name on Facebook. All entrants hold the Smithsonian, its regents, officers, employees, fellows, interns, research associates, and volunteers, as well as Facebook, harmless from and against all claims of any nature arising in connection with entrant’s participation in the contest, acceptance or use of prize. The Smithsonian and its regents, officers, employees, fellows, interns, research associates, and volunteers are not liable for any costs, damages, injuries, or other claims incurred as a result of entrants’ participation in the contest or winner’s acceptance and usage of the prize. The Smithsonian is not responsible for incomplete or misdirected entries, technical or network malfunctions or failures, or causes beyond its control. The Smithsonian reserves the right to disqualify any entrant whose entry or conduct appears in any way to: inhibit the enjoyment of others; tamper with the competition; violate these Rules; infringe on the rights of third parties; or act in an unsportsmanlike or disruptive manner. The Smithsonian reserves the right to cancel the contest or modify these rules at any time for any reason at its discretion. In the event of a dispute regarding the winners, the Smithsonian reserves the right to award or not award the prizes in its sole discretion. By entering this contest, entrants agree to be bound by these Rules and the decisions of the Smithsonian, which are final and binding in all respects. No purchase necessary to enter or win. Contest void where prohibited. Winner is responsible for all taxes on the prize, if any. This contest is in no way sponsored, endorsed, or administered by, or associated with Facebook, and entrants cannot hold Facebook responsible in any way. 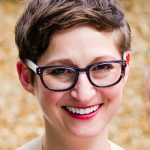 Joelle Seligson is digital editor at the Freer|Sackler.